Irish mythology associates the west of Ireland with knowledge, and we are very much in the west today on Inishmore, the largest of the Aran islands in Galway Bay. This afternoon we’ll be standing high above the Atlantic’s edge on the cliffs at Dun Aengus, a windswept prehistoric fortress on the west coast. For now, however, we’re visiting a gentler and more sheltered spot nestled in the hills. It’s a small monastic site which was founded by Saint Brecan and remained a place of learning and pilgrimage for many centuries back when Ireland was renowned in the Middle Ages as a land of saints and scholars. The name itself -- the Seven Churches -- is something of a mystery since there are only two churches here, but that name is modern anyway. The community was known as Dísert Brecán in medieval times: “Brecan’s desert,” evoking the earliest monastic traditions of the desert fathers who withdrew from society to seek God in solitude. 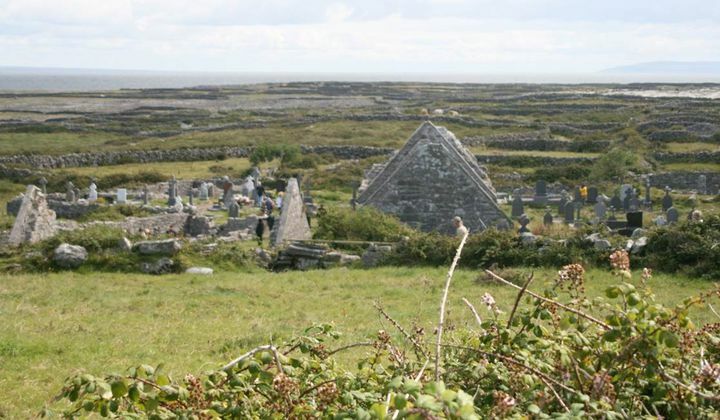 The Seven Churches Monastic Site, Inishmore. Photo by Kathleen Whaley, 2014. Reproduced here with permission. What knowledge do we gain from this place in the west of Ireland? Consider it on two levels like that poem by Seamus Heaney about Saint Kevin. What’s apparent on the surface is that this place is cluttered, literally crowded with the dead. Broken shafts of high crosses with twelfth-century interlace stand guard over graves adorned with photographs, the medieval and the modern meeting in a way that seems very Irish. There are other places to be buried on the island, but this is considered very sacred ground, and so the dead keep squeezing in. With a Ph.D. in medieval history, Cassandra Hannahs spent most of her academic career at Middlebury College in Vermont, where she was a tenured professor of history. At Middlebury, Cassandra regularly taught courses on Celtic, Viking and Anglo-Norman Studies, as well as more general courses on the Middle Ages, the Renaissance, and the history of Christianity. In her research and lectures, Cassandra explores the cultural and political exchanges that have historically linked Ireland, Scotland, England, and Europe. As Study Leader for the Smithsonian since 2000, she enjoys sharing her love and knowledge of the British Isles and Ireland with travelers on land and sea.